Armenia wants to obtain an observer status at the Shanghai Cooperation Organization (SCO) and will need China’s support in his matter, Prime Minister Tigran Sargsyan said during his meeting with Chinese Prime Minister Li Keqiang on Tuesday. The government press office reports that during his meeting with the Chinese official held as part of his working visit to China Sargsyan also spoke about Armenia’s decision to join the Customs Union that now involves Russia, Belarus and Kazakhstan. The Chinese prime minister, for his part, said that Beijing understands well Armenia’s desire to participate in regional processes and is going to actively cooperate with the Customs Union. He also said that he will discuss with partners in the Shanghai Cooperation Organization Armenia’s desire to obtain an observer status at the organization. 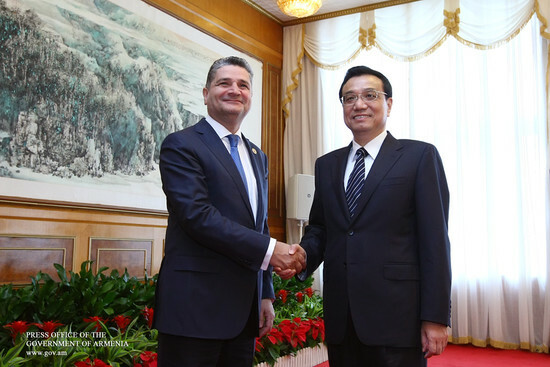 While in China Prime Minister Sargsyan also met with his Bulgarian counterpart Plamen Oresharsky. According to the government press office, during the meeting Sargsyan briefed Oresharsky on Armenia’s current economic state, and the head of the Bulgarian government, for his part, acknowledged “quite impressive showings” registered by Armenia. Both sides attached importance to strengthening business ties between the two countries, which they say would give a fresh impetus to Armenian-Bulgarian economic relations. On his way to China, on Monday, the head of the Armenian government made a stopover in Kazakhstan to meet with Kazakh Deputy Prime Minister Kayrat Kelimbetov. During the meeting Kelimbetov reportedly presented to Sargsyan a package of technical solutions needed for Armenia’s accession to the Customs Union. Documents on Armenia’s entry to the Customs Union may be signed as early as May 2014, according to a senior Russian government official.